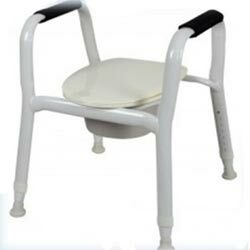 This over toilet aid is constructed from super lightweight and sturdy aluminum tubing. The seat and lid are made from a high density plastic to minimize flex. Wider non slip rubber suction cup feet offer better stability. Height adjustable legs allow customization to suit the individual height of the user. Painted up to 100 microns which is 3 times thicker than normal coating to prevent scratches. Can be used as bedside commode.